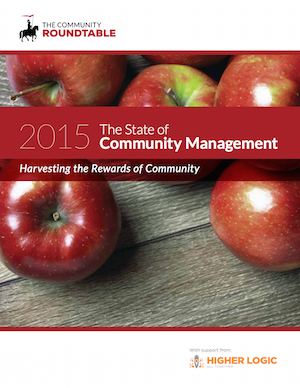 In my line of work as a collaboration and community strategist, one of the key milestones each year is the early summer publication of the State of Community Management report by the The Community Roundtable group. It tends to provide accurate measurement of the progress of online communities within organisations around the world, as well as offering terrific insight in terms of how one’s own customers and projects compare to the both the average and the very best communities elsewhere. In 2009, we noticed the adoption of social tools and technologies begin to skyrocket, but there was no corresponding attention being paid to community management. Our collective background in business operations and technology (Rachel) and community strategy and management (Jim) set off warning bells. We knew the use of social technologies would open a pandora’s box of implications and challenges for organizations. There were a few early community practitioners who understood what it would take to be successful and we knew that their tacit understanding would be critical to capture and share if the social media, community and social business disciplines were to grow. The Community Roundtable was our answer to this need. Reporting on ‘inactive’ populations in our engagement profile – critical for putting the other engagement categories into context. Discussion of some of our ‘data dilemmas’ as we analyzed the data, which will give you some insight into areas of the research that are still immature or non-standard. This year’s research is as interesting and insightful as usual. I’ve been working through the key findings and recommendations this week, and have been delighted to see how closely the research aligns with Jive’s existing strategy and methodologies. However, there’s a huge amount of great content in the report, presentation and recording, am so I’m still digesting what changes I’ll make to my own recommendations as a result of this year’s info. If you’re either a community manager yourself, or else consult on topics in this area, I really do see this research as being an essential part of your arsenal. I couldn’t recommend it more highly.